A wealth of biochemical and genetic evidence has demonstrated that protein kinase CK2 has critical roles in the regulation and execution of numerous biological processes. Large-scale proteomic and phosphoproteomics studies have further reinforced the widespread impact of CK2 on cellular events through interactions with many cellular proteins or protein complexes and through phosphorylation of a vast number of cellular proteins. Given its global participation in many fundamental processes, it is not surprising that CK2 has been implicated in numerous human diseases, a factor that has spurred interest in CK2 as a candidate for molecular-targeted therapy. Despite this growing profile, many questions regarding its precise mechanisms of regulation remain. In fact, several lines of evidence suggest that CK2 is constitutively active, leading to a speculation that CK2 is an unregulated enzyme. Accordingly, there is an apparent paradox that leads to the question of how an unregulated enzyme such as CK2 can be a participant in regulatory processes. In an effort to resolve this paradox, studies in our lab and others have focused on an investigation of the relationships between CK2 and other cellular pathways. Using a combination of computational predictions and database mining together with proteomic strategies and biochemical assays, we have been elucidating systematic relationships between CK2 and regulatory pathways where CK2 phosphorylation sites overlap other posttranslational modifications. Overall, these studies suggest intriguing mechanisms by which CK2 can participate in regulatory events and also how alterations in CK2 levels that accompany disease may promote pathological rewiring of regulatory pathways. Our experimental studies on CK2 have been supported by operating grants from the Canadian Institutes of Health Research and the Canadian Cancer Society Research Institute. We also acknowledge past and present members of the Litchfield lab including James Duncan, Sam Fess, Michelle Gabriel, Adam Rabalski, Nicole St. Denis, Jacob Turowec, Greg Vilk, and Stephanie Zukowski whose experimental contributions have contributed to the concepts highlighted in this chapter. 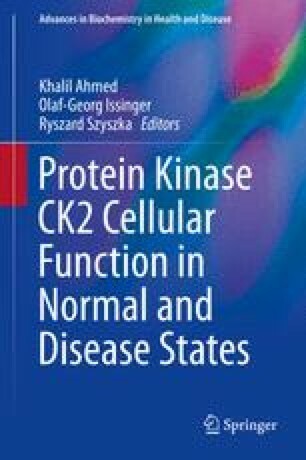 Finally, we apologize to our colleagues for omission of important citations that were incurred in the interests of being concise—and encourage readers to view other chapters in this book for more insights on protein kinase CK2.